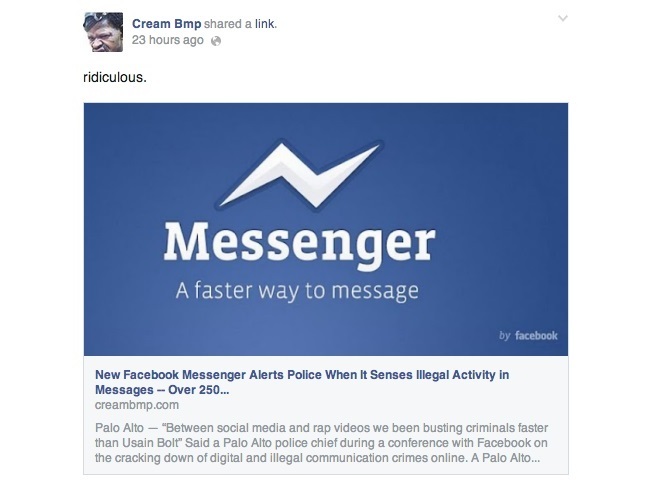 With all of the mostly misguided hysteria about Facebook’s Messenger applications and the user data they request permission to access, satire and entertainment blog Cream Bmp Daily may have concocted the most outlandish tale to date, saying that illegal conversations conducted on the messaging apps are being forwarded to law-enforcement authorities. 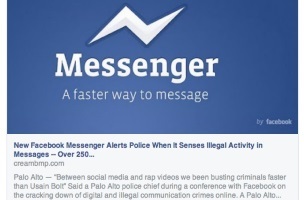 Business 2 Community reported on the hoax, saying that the post from Cream Bmp Daily claims that more than 250 Messenger users have already been arrested due to illegal conversations, and adding that Facebook provides police with immediate text alerts, as well as users’ locations. Well played, Cream Bmp Daily, but there is obviously no truth to this report. Readers: Have you seen similar stories in your News Feeds? Screenshot courtesy of Business 2 Community.